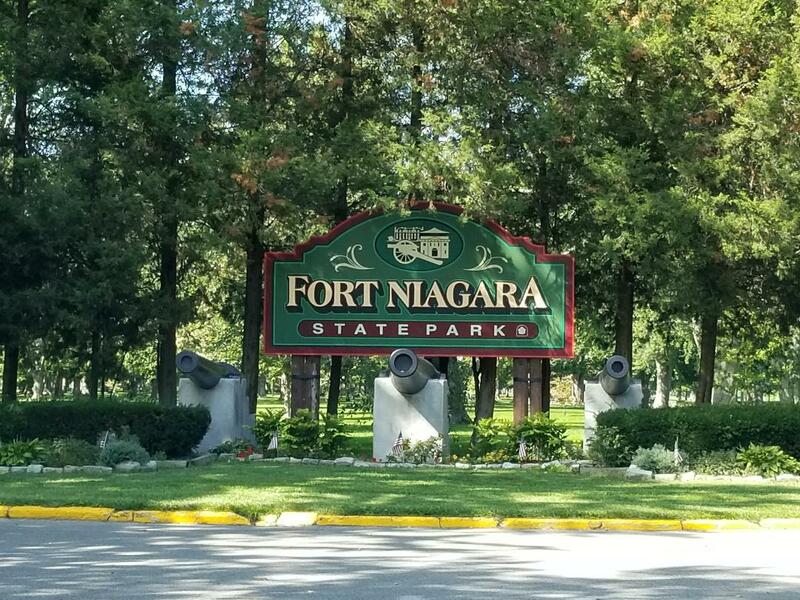 After we had stopped by our rental house and changed into dry clothes after our wet morning at the falls we headed out to Old Fort Niagara. We stopped a local restaurant: The Youngstown Galley and had an amazing lunch! Youngstown was so cute and I wished we had had more time to explore it but we knew the fort was only open until 5! We arrived at the fort around 3 and we were just in time for a short video presentation about the history of the fort. After the movie there was a volunteer guide that offered to lead us around the fort and tell us more about it; we were thrilled! 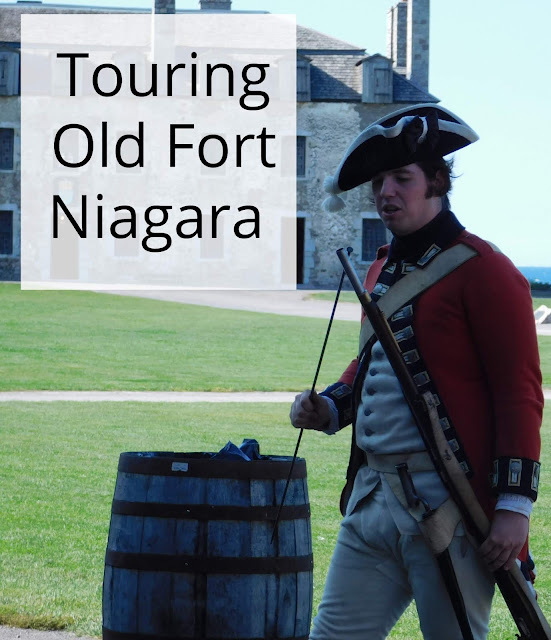 Once outside our guide talked to us about the fort, the make up of it, the battles fought and lost, the type of warfare that was used when the fort was designed, why the fort was placed here at the mouth of the Niagara river, etc. The only entrance to the fort; it would have been a drawbridge back in the day to make it harder for the enemies to gain entrance. Isn't it a beautiful spot? You can't see but further down the river (across from where we ate lunch actually!) was an old Canadian fort and there was a battle where these two forts were shooting canon fire at one another. The architecture was amazing! We actually went up in these sentry towers and were amazed at how far we could see! The flags; American, British, and the all white flag is actually a French flag with a white background and a white fleur de lis. This is an old woodworking shop; the building is not authentic to the time but there was a wooden woodworking building in this spot as part of the original fort. It was a clear enough day to see to Toronto in the distance. Looking out the opened roof. Checking out the canons up close. Watching a musket firing demonstration and learning a lot about what life would have been like living at the fort. A diorama of the whole fort. The kitchen garden and bread house. One of the dining rooms in the French castle; used by the higher ranking officers. What a trading post with the Native Americans might have looked like at the time. Versus enlisted men; who would be sharing this room with a dozen or so other men. We just had to climb up and check out the view from the other sentry tower. Checking out the small blacksmith shop. While I wished we had had more time to really explore and read about everything at the fort we really did have a great time learning about the history and the life here at the fort. I wish I'd have gone here. That open roof view is amazing! It was really neat and I wished we had had more time to explore. Wow! Thanks for the virtual tour! That is an awesome fort! Loved the cannons and the view!